Are you ready to take your off-roading adventures to the extreme? Chevrolet has teamed up with American Expedition Vehicles (AEV)for the first time to bring you the new Colorado ZR2 Bison and we have it right here in Wilmington, NC at Jeff Gordon Chevrolet. This Bison will be ready to take off-roading as soon as you take it off the lot, as it comes equipped with many protective features straight out of the factory. 5 skid plates which cover the engine oil pan, fuel tank, transfer case, and both front and rear locking differentials. The 5 skid plates are constructed of hot-stamped Boron steel which is a rarity for a production vehicle. AEV- designed stamped steel front and rear bumpers is also a key focus on off-road protection. The steel bumpers give you excellent protection while traversing obstacles like rocks and logs. Other key components are; trail recovery with the front featuring winch provisions and recovery points which are integrated into the rear. Another one is standard fog lights below the traditional headlights. Rather than the traditional Chevrolet bow-tie, the Bison will have an exclusive flow-through “CHEVROLET” lettering grille. “Bison” decals are on the bedsides along with an “AEV Bison” logo on the tailgate of the new Colorado variant. Wrapping the all-new ZR2 Bison-specific 17×8 inch aluminum tires wheels are the 31-inch Goodyear Wrangler Duratrac off-road tires. A standard all-terrain ZR2 Bison spare tire comes with the truck along with special larger ZR2 Bison fender flares, the Bison-specific wheels and fender flares were co-developed by AEV. Want to take this beauty for a test drive or even better take it home? Come by Jeff Gordon Chevrolet to check it out! See all of the awesome features, and plan your new off-roading experience with the all-new Chevrolet Colorado ZR2 Bison. Brian traded his Chevy Malibu for this 2011 Impala and Chris Whitehurst helped him keep the same payment! Congrats and welcome to the ‪#‎JGCFamily‬! Chris Whitehurst helped James trade his 2015 Silverado for brand new 2016 Silverado High Country – making it his 3rd purchase from us in 3 years! Congrats and thank you for being a loyal member of the ‪#‎JGCFamily‬! Errington Licorish helped Victoria trade in her 08 Malibu for this brand new 2016 ‪#‎ChevyCruze‬! Beautiful! Welcome to the ‪#‎JGCFamily‬! Chris Whitehurst welcomed this military couple to the ‪#‎JGCFamily‬ and helped them into their new 2012 Malibu! Congrats, Emily & Avery, and thank you for your service! Jennifer just came to visit us for the first time to trade in her 2012 Honda CR-V. Now she’s the happy owner of a 2012 VW Jetta with 20,000 less miles and paying $200 less a month on her car payment. Pretty amazing! Congrats and welcome to the ‪#‎JGCFamily‬! Chris Whitehurst helped Hope upgrade her 99 Mustang to this certified 2015 Chevy Cruze! That’s huge – Congrats and welcome to the ‪#‎JGCFamily‬! Austin Briggman & Chris Whitehurst helped Donna from South Carolina into her 2012 Dodge Ram 1500! Congrats and welcome to the ‪#‎JGCFamily‬! Chris Whitehurst helped Margaret get into the perfect vehicle with her brand new 2016 Cruze Limited! Congrats and welcome to the ‪#‎JGCFamily‬! Allen Lekocevic & Adam Vitale helped Courtney into this beautiful 2012 Chevy Suburban – A little more fitting than her 16 Kia Sorento for her growing family 🙂 Congrats and welcome to the ‪#‎JGCFamily‬! Nikolas came in looking to trade his 07 Nissan Titan with a newer truck – Grady Ward helped him get into this beautiful brand new 2016 Silverado Z71! Congrats and welcome to the ‪#‎JGCFamily‬! Shadon Miller helped Glen & Mason into their first purchase at Jeff Gordon Chevy – a 2010 Nissan Rogue! Congratulations and welcome to the ‪#‎JGCFamily‬! Chris Whitehurst helped his good buddy Joe trade his 2012 GMC Sierra for something with better gas mileage – He left the happy owner of this certified 2015 Equinox and a new member of the ‪#‎JGCFamily‬! Congrats! Joe McCaul helped Vlad trade his 2005 Corvette and 2015 Ford F-150 for this awesome 2013 Jeep Wrangler Rubicon! Congrats and welcome to the ‪#‎JGCFamily‬! Lynwood Evans helped Robert M. of Hampstead, NC into his beautiful new 2016 Chevy Tahoe Z71! Congrats and welcome to the ‪#‎JGCFamily‬! Chris Whitehurst welcomed Debbie into the ‪#‎JGCFamily‬, helping her into her (practically) new 2016 RAM 1500 – only 13,000 miles! Congratulations! Sharon & Johnny of Rocky Point, NC really wanted a red Camaro – We didn’t have one here, but Sam Saunders was able to find one at our sister store in Charleston, SC and get it here for them! Congratulations and welcome to the ‪#‎JGCFamily‬! George H. of Clinton NC upgraded his 2009 Silverado for this beautiful lifted 2016 Silverado Midnight Edition – Wow! Congratulations and welcome to the ‪#‎JGCFamily‬! Joe McCaul helped Bill out of his 03 Ford F-150 and into his brand new 2016 Silverado Blackout Edition! Congratulations and welcome to the ‪#‎JGCFamily‬! Chris & Ryan traded their 2007 BMW 7-Series for this much bigger 2016 Suburban LTZ! Congratulations and welcome to the ‪#‎JGCFamily‬! Mandi decided to let go of her 1986 Toyota Celica and picked her great friend of over a decade, Austin Briggman, to help her find her new vehicle. She’s now a proud owner of a 2011 Kia Soul! Congrats and welcome to the ‪#‎JGCFamily‬! James S. came from Pembroke, NC to purchase his first vehicle from Allen Lekocevic at Jeff Gordon Chevy and is now a happy owner of a brand new 2016 Silverado! Taking advantage of his supplier pricing discount, he was able to save over $10,000! Amazing! Congrats and welcome to the ‪#‎JGCFamily‬! Jay Flores helped Arturo & Elizabeth into their second vehicle from Jeff Gordon Chevy, trading in their 2011 Equinox for this beautiful 2014 Silverado! Congrats and thanks for being loyal members of the ‪#‎JGCFamily‬! Austin Briggman helped Christy trade her 2004 Hyundai Santa Fe for something with a little more room, a 2008 Ford Explorer! Congrats and welcome to the ‪#‎JGCFamily‬! Richard & Kappy are happy new owners of this beautiful new 2016 Chevy Colorado! Congrats and welcome to the ‪#‎JGCFamily‬! Sharod Wallace welcomed Marsha S. into the ‪#‎JGCFamily‬ helping her into her beautiful new 2016 Chevy Tahoe LT! Congratulations! Chris Whitehurst helped Tori J. of Southport, NC find the perfect vehicle to fit her needs AND match her top 🙂 She’s now a happy owner of this 2014 Hyundai Accent! We love it! Congrats and welcome to the ‪#‎JGCFamily‬! Robert the Wilmington Chevy Guy helped Michael trade his 2014 Silverado 1500 for this jaw-dropping 2016 Silverado 2500HD Midnight Edition! Congrats and thanks for being a loyal member of the ‪#‎JGCFamily‬! Robert Baransky helped Danielle into just what she needed for her budget and family – She traded her 2007 Tahoe for this beautiful certified 2016 Traverse! Congratulations and thanks for being loyal members of the ‪#‎JGCFamily‬! Ryan Shumate helped the Nunez family from Jacksonville, NC into their 2012 Malibu – Their first purchase from Jeff Gordon Chevy! Welcome to the ‪#‎JGCFamily‬ and enjoy! Stephen Hooper & Allen Lekocevic turned Kyle’s dream truck into reality – helping him out of his 2004 Silverado for this 2010 GMC Sierra 2500HD Duramax Diesel! Awesome. Congrats and welcome to the ‪#‎JGCFamily‬! Lina came back to Chris Whitehurst for the second time, looking to upgrade her 2013 Impala for a newer one. Now she owns a beautiful certified 2016! Congrats and thanks for being a loyal member of the ‪#‎JGCFamily‬! Ryan Shumate helped Jessica upgrade from a 2005 to a brand new 2016 Chevy Malibu! We love it! Enjoy and welcome to the ‪#‎JGCFamily‬! Shadon Miller helped Odell of Ocean Isle Beach, NC upgrade his 2006 Lexus GX 470 for THIS 2014 Sierra 2500HD Denali with only 11,000 miles! Awesome! Congrats and welcome to the ‪#‎JGCFamily‬! Brian Kane helped Jessica & Matthew trade their 13 Equinox & 05 Silverado and save OVER $9,000 with Jessica’s Educator Discount on their new 2016 Silverado Z71! Congrats, you two, and welcome to the ‪#‎JGCFamily‬! Joe McCaul helped Gregory find a new truck for his landscaping business (Lyon-N-D-Grass), trading his 06 F-350 for this 2016 Silverado 2500HD Duramax! Congrats and welcome to the ‪#‎JGCFamily‬! The North American Truck of the Year – the all-new Silverado 1500 – has been adopted to join the police force as a Special Service Vehicle (SSV) and should start showing up on highways near you this summer, according to Chevrolet. The Silverado 1500 Crew Cab “SSV package” will be a combination of the standard/base work truck (WT) and 1LS trim levels. They’ll use the same 5.3L EcoTec3 V8 engine that is available to consumers – producing 355HP and 383 lb.-ft. of torque (while still getting 23 MPG highway.) But that’s where the similarities end. 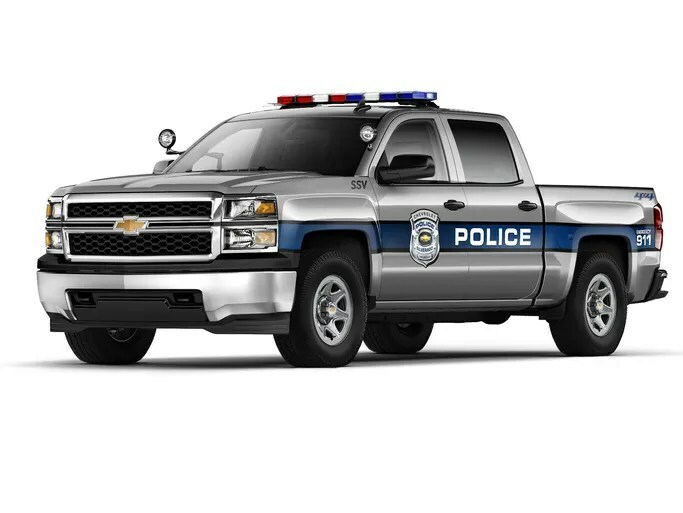 The Silverado SSV will be equipped with a 170-amp high-output alternator and 730-CCA auxiliary battery, which will allow officers to drive and operate all of those computers, cameras, radios, and, of course, those flashing blue lights. Other optional equipment will include spot lamps, siren system, and strobes for the grille, headlights, and taillights. Law enforcement agencies can also choose to swap the center seat to mount a vertical gun rack or computers, mount an auxiliary dome lamp, or install a rear-view camera. There will also be another feature called the “common key package” that would allow a municipality to operate all of their Tahoe PPV and Silverado SSV trucks with the same key. So why the Silverado? Along with being awarded Truck of the Year, Pickup of the Year, Four-Wheeler of the Year, and dashing good looks, the Silverado 1500 was also recognized for its low cost of ownership, an important deciding factor for municipalities and government agencies. Other government agencies such as fish and game enforcement and border patrol are liking the idea of the Silverado SSV as well. We got more photos of the Silverado, Tahoe, and other vehicles to keep your eye out for on the road below. Chevrolet enthusiasts have been waiting for quite some time for General Motors to offer a high-performance pickup truck that would rival the Ford Raptor. Well, their wait is about to end thanks to Lingenfelter and Southern Comfort Automotive, who have developed the most powerful version of the 2014 Silverado – the Reaper. The Reaper is fitted with a new front fascia, which includes a high clearance bumper, grill and hood. It is equipped with 17 inch bead-lock rims with 33 inch off-road tires and uses a Fox Racing suspension system, making it ready for all off road adventures. There’s also an integrated floodlight system and a reinforced plate. The supercharged V8 engine producing 550HP is provided by Lingenfelter, and is connected to a Corsa exhaust system. The Reaper is also sporting custom exterior graphics, a bespoke gauge package and stitched headrests. All it seems to be missing is a little more cowbell. The high-performance truck will have an estimated price of $50,000-$60,000 (which isn’t far off from the current Silverado 2500HD) and will only be available to select Chevrolet dealerships in the U.S. ( like Jeff Gordon Chevrolet in Wilmington, NC.) More details on the 2014 Chevrolet Reaper will be released in the coming week. Meanwhile, you can have a look at the truck’s dedicated website. If you’re interested in being on the list for the first Chevrolet Silverado Reaper when it arrives at Jeff Gordon Chevrolet, just call the internet sales hotline at (910)798-2650 or toll free at (888)261-0090 and we’ll keep you updated! Is GMC Going to Gain its Own Identity? For the past two decades, the GMC lineup has been parallel to Chevrolet’s SUV and truck lineup. For the Chevrolet Silverado, there’s the GMC equivalent, the Sierra. For Tahoe and Suburban, the GMC Yukon and Yukon XL. The GMC Acadia and the Chevy Traverse are the lineups 3rd row SUV’s, and the Equinox and Terrain – crossovers. But now, GMC is planning on de-railing from Chevrolet with their GMC Granite concept. First introduced in Detroit in 2010, the Granite was presented as a smaller, boxy “urban utility vehicle” (UUV?) similar to the Scion xB or Nissan Cube – designed to appeal to a younger crowd, with a bold exterior, an interior reminiscent of loft-style apartments, and full-sized rear suicide doors. From bumper-to-bumper, the concept measures only 161 inches, making it shorter than the Chevy Cobalt (now the Cruze), and would definitely make it the smallest vehicle on the GMC lineup. But GMC has another concept: the Sierra All-Terrain HD, which is, for lack of a better word, beastly. No official word has announced that either of these will be put into production, yet. But in our opinion, we think that only one or the other should be produced since that All-Terrain looks like it would eat the Granite for breakfast. Tell us what you think!